Today, ten months ago, Thomas and I started Justaddwater.dk. 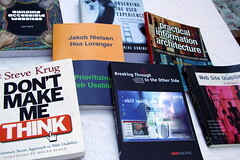 Our purpose then was to share our thoughts about usability and web standards. It’s time to review our profile after ten months with 135 posts, 420 comments (not to mention 10,000 spam comments) and over 500 links from 250 websites (according to Technorati). Justaddwater.dk is mostly about usability, accessibility, web standards, and the technologies that drive and power the web. Expect to find articles from our daily work with web development and usability issues, and also occasionally a post or two on other topics. Initially we wanted to start the blog to raise awareness internally in Capgemini on usability, and communicate usability with our colleagues. The corporate existing channels were not appropriate for us, because we estimated that we had a too small audience to get momentum behind an internal website/newsletter/blog/whatever. This weblog is meant to deal with all aspects of usability. Here we will write about new and interesting technologies that hopefully will make usability easier to implement into your software or website. We will offer you our best tips and tricks and from time to time take up interesting projects and talk about our concerns and what our solution was. After blogging for a while, we started to get feedback from people we never dreamt of. The style of the blog encourages dialog and we were thrilled to see comments and feedback from Jakob Nielsen, Jared Spool, Eric Reiss, John Rhodes, Joe Clark, Jonathan Boutelle, and many others. Thanks for all your comments. Our blog wouldn’t be the same without you! This entry was posted by Jesper Rønn-Jensen	on Monday, August 14th, 2006 at 23:08 (GMT-1)	and is filed under Blogging, justaddwater.dk. You can follow any responses to this entry through the RSS 2.0 feed. Both comments and pings are currently closed. Yay! I made it onto a top list, what do I win?